Give me a head with hair, long beautiful hair. Shining, gleaming, streaming, flaxen, waxen. Here baby, there, momma, ev'rywhere, daddy, daddy. 1. How often do you get your hair cut? 2. Do you go to the same stylist each time, try someone new, go to the cheap hair cutting chains or live it up in a salon? I like to stick to the same hair stylist. I have been going to my stylist for about 2 years now. I do however like to switch up my cuts. I'm always about trying something new. I love my stylist since she always gets excited about cutting my hair because she likes that I switch up my hair cuts. 3. Do you color your hair? How often? What’s your natural color? I first highlighted my hair sophomore year of college (did the out home stuff with a couple of friends which was a fail) and continued to do so (by a professional) until my senior year then I just stopped. Not to long ago did I go get my hair cut and highlighted. 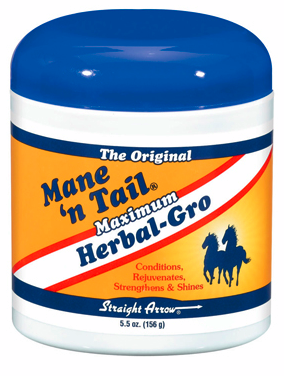 I just started using Mane and Tail Maximum Herbal Gro pomade a few months ago. I use it after every wash. I put it in while my hair while it is still wet but I first rub it in my palms first to get it warmed up and then flip my hair over and rub it in. To make sure it really gets in there I wrap my hair in my towel for a few minutes before styling. I really have noticed a difference. I would have split ends by now and styling my hair is so much easier. 5. What hair trend do you love and wish you could rock? Long braids!!! Especially the fish tail braid, if I had long hair I would def. learn how to do these. I miss my long hair. I'm trying to grow it all back! LOVE the fishtail braid. One of my favorite hairstyles at the moment. I would love to rock a fishtail braid as well! I'm so glad the Mane n Tail stuff is working for you! !